It's been a really long time since I bought a hairbrush. I have a hairstyle that is more finger styled then anything else so I don't tend to use one a lot. But when you get to the point where all the little rubber tips fall off the bristle ends you know it is time for something new! I've always used Goody brushes and it's fascinating to see how many new styles there are from the last time I bought one! Ouchless for fine to normal hair - $14.99 - Comfort Gel - Snagless styling for comfortable detangling - this one was my pick! Of course it's pink which is important but it also has this cool gel handle that is so easy to hold and doesn't go flying out of my hand when I am trying to use a hairdryer and hairbrush at the same time. And since I do have fine hair which does get tangled, this seemed like the perfect choice. 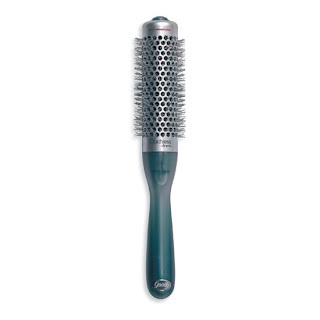 Ouchless comfortable volumizing - $13.99 - Release Button - for short hair - what a clever idea! 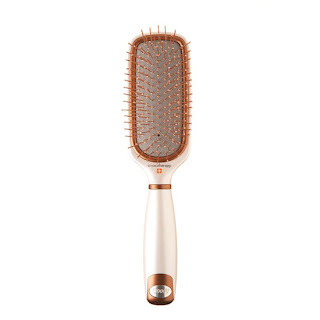 It's a round styling brush that has a button on the end so you can style your hair and push the button to release your hair if it gets tangled. I don't know how many times I've walked around with a round brush caught in my hair after a styling mishap! Styling Therapy - Reduce Dandruff - $14.99 - brush away flakes with Copper Oxide which kills 88% of the fungus that causes dandruff - heat safe - here's a great idea if you are flake prone! I would love to hear if anyone has used this one and how you liked it! Oh wow, I'd love to see how effective the release function on the volumizing brush is!